Obama Taxes Show Big Drop In Income, Charitable Giving : The Two-Way The Obamas reported an adjusted gross income of $481,098, a 21 percent drop from the $608,611 they reported in 2012. President Obama and first lady Michelle Obama arrive at John F. Kennedy International Airport in New York on Friday. 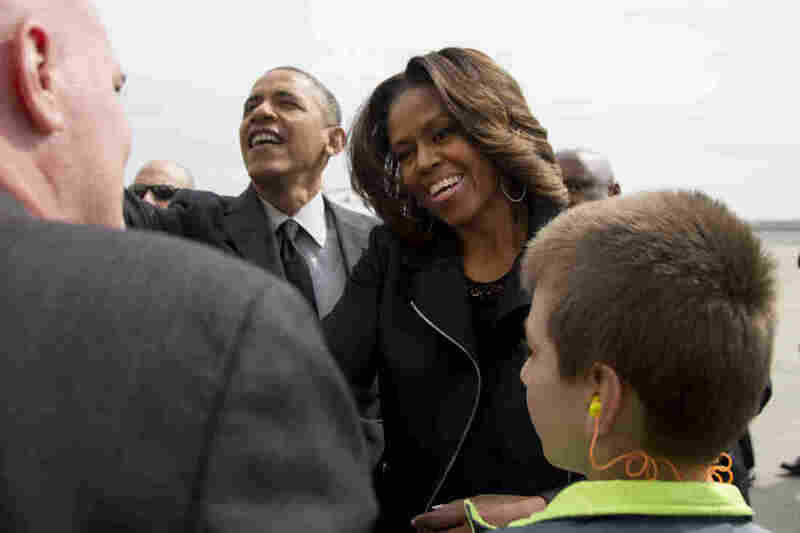 President Obama and first lady Michelle Obama released their tax returns for 2013 on Friday. They show the couple saw a big drop in income and charitable giving. They paid $98,169 in federal taxes on a $481,098 income. In 2012, their income was $608,611. "The 42-page document, which included the couple's Illinois state income tax return, shows the Obamas reported donating $59,251 to 32 charities, which helped lower their overall tax bill. The nearly $60,000 in donations represents 12.3 percent of their adjusted gross income. "But their charitable giving was down sharply from 2012, when the president and first lady reported giving away $150,034. "Their largest charitable gift last year, $8,751, went to the Fisher House Foundation, which supports military families. The Obamas gave the foundation $103,871 in 2012." USA Today reports the drop in income has to do with book sales. "The Obamas reported $273,739 income from publishers/agents in 2012, but only $116,180 in 2013," the paper reports. The White House says the Obamas also paid $23,328 in state income tax.